Lyme Regis is clearly sign posted. When you ring a few days before your arrival to arrange key collection I will give you detailed directions depending which route you will be coming from. We also have a train station in Axminster near-by with a 15 mins bus ride,bus 31, to Lyme Regis Post office. 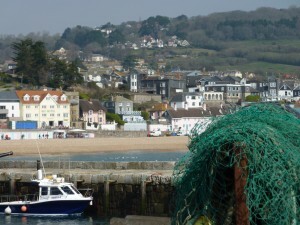 To Lyme Regis and the area around is quite hilly, we are near the bottom of the main street just 3 minutes walk to the beach. Sea Tree House is opposite the Butchers Shop and next to The Cornish Bakery down a little passageway on the seaward side of Broad Street, the main street in Lyme Regis. Here you can safely unload and load your car for Tulip Tree and Tamarind Tree Apartments which are based here. 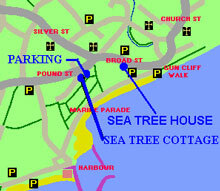 Sea Tree Cottage is just up the road next to the Parking spaces. I will direct you and be there to meet you at the properties. Please be aware that if you need parking right next to you or you don’t want a seven minute walk up the hill to collect your car then Sea Tree Cottage is the best Apartment to book.